Green roofs, sometimes referred to as a “Living Roof,” are an innovative way for commercial customers to enhance not only their property, but also the air and environment around them. These roofs are just as they sound: green! A growing medium or vegetation of some kind is installed over several layers of protection and waterproofing, similar to standard commercial roofing materials, so you’re not compromising function or durability. In fact, green roofs have many additional benefits to standard bitumen and multi-ply systems. Much like solar roofing, green roofing is a fantastic way to harness natural elements in a way that actually enhances your commercial property and can even lower your energy bills! Burell Built Exteriors is proud to bring our commercial customers green roofing in Knoxville, TN and Chattanooga, TN. Call us to learn more: (865) 385-6926. While green roofs are relatively new within the US, many areas of the world have been enjoying the benefits of this eco-friendly option for years. Their popularity has grown rapidly, and an investment in green roofing could mean significant resale appeal for your commercial property. Aesthetically Appealing – Improve those rooftop views and even create additional usable space. Air Purification – Plants and vegetation will capture or filter airborne pollutants and noxious gasses. Energy Efficient – Insulation offered by rooftop greenery will reduce stress on air conditioning and cooling systems, especially when exposed to extreme climates. Increased Durability – The protective layer of vegetation prevents stress to the waterproofing membranes, reducing wear and environmental stress on the underlying, core structures that protect the roof. Storm Water Management – Because the material absorbs and utilizes storm water, there will be less of a burden on runoff and sewer systems. There is a lot of potential with green roofs, and we anticipate that the demand for and perceived value of this system for commercial roofing will to continue to soar. Contact us for a free green roof estimate! Go Green at Home, Too! Most commercial property owners are also homeowners, so keep in mind that green roofing is a great solution for your home roof as well. Residential roofing customers can appreciate all the same benefits as our business customers, and we’d all be contributing toward making the world a little greener, one roof at a time! 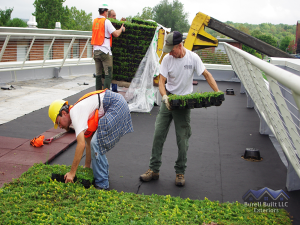 Let the Burell Built team install green roofing at your Knoxville or Chattanooga, Tennessee home or business. Updated on September 16, 2016 at 1:29 pm by Burell Built Exteriors.